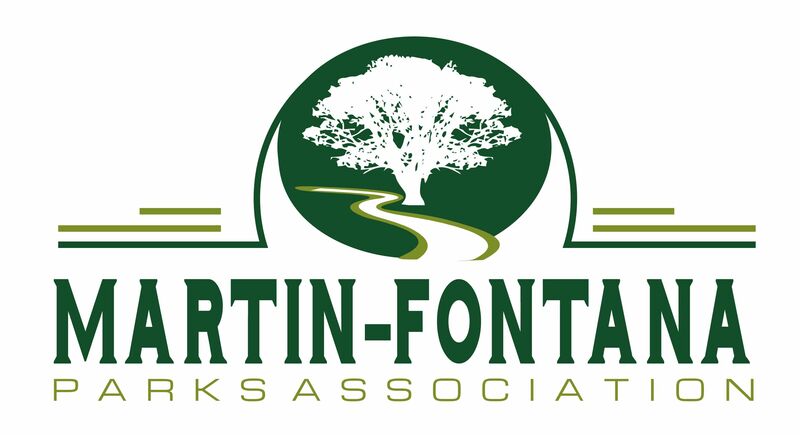 On Arbor Day, April 27th, an enthusiastic audience participated in the dedication of a large grove of magnificent oak trees in Jeffrey Fontana Park. Cub Scout Pack 282, Boy Scout Troop 262, and Daisy Troop #61229 from Los Alamitos, began the program with the Pledge of Allegiance. Tom Morse, President of TJ Martin Neighborhood Association and Linda Wilson, MFPA President, introduced the first speaker, Councilmember Nancy Pyle. Both thanked her for her unwavering support. In reply, she in turn thanked the TJ Martin Neighborhood Association, who addressed neighborhood issues of soccer, traffic, and crime in the area and MFPA for their work in saving the trees in the parks and enhanced unsightly areas. At the same time Councilmember Pyle also announced a grant for $2000 from her office for the non-profit MFPA. City Arborist Ralph Mize described why these trees qualified for a designation as Heritage Trees and explained that Heritage Trees enjoy a protected status in the City of San Jose. James Reber from the San Jose Parks Foundation described the unique relationship Martin-Fontana Parks Association has with them. Working with the San Jose Parks Foundation has made it possible for MFPA to receive restricted grants from donors. The foundation works with a wide range of park related nonprofits and associations throughout San Jose. MFPA especially thanks Association members Vince Piazzisi and Joy Stevens who worked relentlessly for over a year to achieve the Heritage designation from the City. We also thank all of our park partner organizations and our volunteers who work so hard to plant and water the trees and shrubs in MFPA projects, and tirelessly spread endless mountains of mulch to reduce the need for defoliant sprays for weed control. 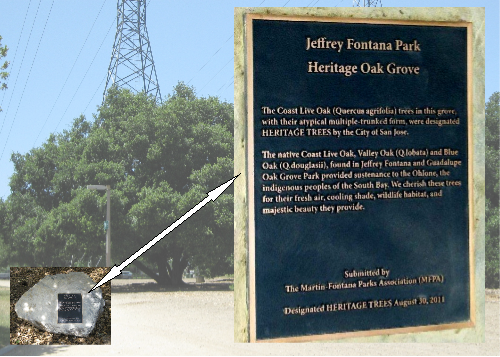 Be sure to take the time to pause under the shade of those magnificent Oaks and read the writing on the plaque. 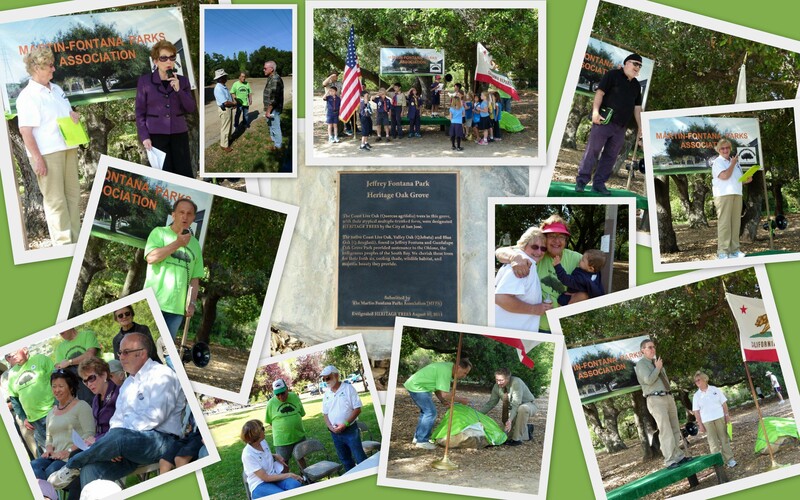 The Heritage Tree Dedication was fabulous. Many thanks to all who worked so hard to make this event so special for the community. The MFPA continue to put smiles on the faces of Almaden residents. The MFPA board and members really put their hearts and souls into making the parks beautiful for all to enjoy! More hands would make less work for everyone. I hope you will think about how you can help too !